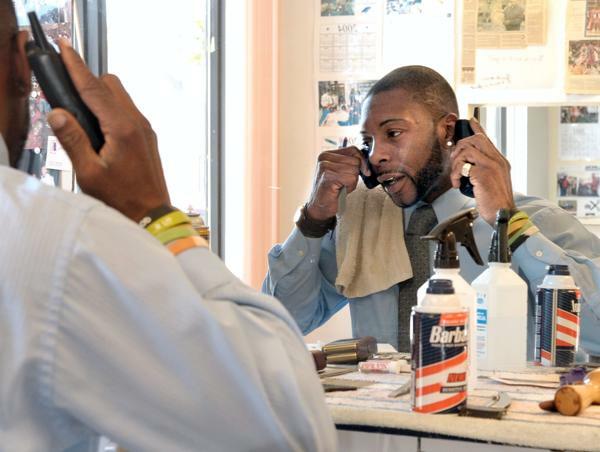 By Phil Johnson/For The News-Gazette — Cutting hair in the barbershop no one ever expected him to own, Seon Williams entertains in frenzied, fluid motions. In front of him rests a client, to the left a ringing phone he will not answer, to the right one of 30 or so visitors who stops by every day to show love. The 42-year-old’s 2008 black Mercedes-Benz SL 550 convertible, visible through the window behind him, sits parked out front of The Whip Hair Designs in Champaign. Newspaper clippings, plaques, neighborhood event fliers and funeral programs paint his walls. Photos of friends and family frame his faded mirror. A scissor cut here, a close shave there, and Williams steps back to admire his work. Later today, he and his funeral director will take a body resting in his funeral home across town for cremation. He will also sell a family its first insurance policy. He will return to his shop intermittently for scheduled haircuts. He hopes to have time to attend tonight’s Champaign City Council meeting. But, right now, something he heard at church last Sunday has Williams reflecting on the meaning of real friendship. A razor wrapped in the long, thick brown fingers of his right hand waves side to side as he speaks. “Pastor Johnson over at Jericho said if we just listen, we will see who our true friends are,” he says as his soft brown eyes widen from ovals to circles as if to say, “Think about that.” His eyes do that a lot.